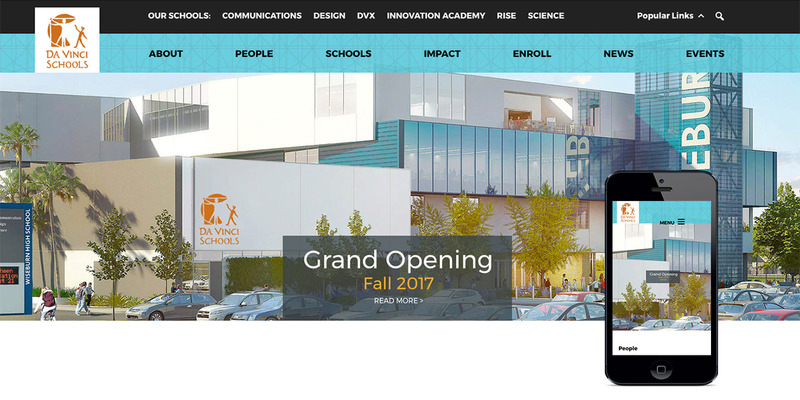 Da Vinci Schools has launched a new, mobile-friendly website – www.davincischools.org – with many new features suggested by Da Vinci families, staff, and other stakeholders. The new site features a clean, bold and uncluttered design; easier navigation; direct links to each school blog; and a central calendar system with events from all schools and athletics housed in one place. “The new website really conveys the spirit of Da Vinci Schools — it’s bold and innovative and emphasizes our commitment that every Da Vinci student graduates with the skill sets needed for college and real-world readiness,” said Dr. Matthew Wunder, Da Vinci’s CEO. The new site, built according to Level AA web accessibility standards, was designed for a variety of users, including current families, prospective families, community members, industry partners, donors and other education stakeholders. The new website was designed and developed by Jami Miyamoto of Studio Roja and Ann Zumwinkle, Doug Bland, and the rest of the team at Zumwinkle.com. Carla Levenson, Da Vinci’s Director of External Relations was the project manager, planned the site architecture, and contributed content. Additional contributors included Da Vinci Design teacher Patrick Hidalgo; Da Vinci Science art teacher Michael Prendergast; DVX student Ashley Zurita; Kevin Hunley, Da Vinci’s webmaster; Rocio Ansari, CMO executive assistant; and Gloria White, Da Vinci’s data guru. Special thanks to Steve Aanenson at Trumba for patiently offering his professional guidance. We are enormously grateful to our entire web team for their time, talent, and incredible dedication to this project. We hope to roll out new features on the website in the coming months, including student-created videos. We invite you to explore our new website and let us know how we’re doing by emailing info@davincischools.org. → FutureCon 2037: What Does The Future Look Like?